G. Crawford Wiestling, FCE | Investigative & Loss Control Services, Inc.
Mr. Wiestling is a nationally recognized fire investigator and co-founder of ILC. 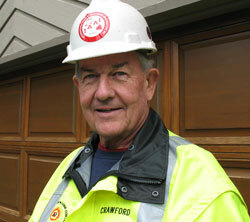 He began his career in 1957 as a Firefighter in Shippensburg, PA. Since then, he has also served as Director of Public Safety for Lock Haven, PA and Fire Chief of Southampton Township, Franklin County, PA. In 1977, Mr. Wiestling joined the law firm of Robins, Zelle, Larson & Kaplan as a Fire Investigator. His fire investigation duties continued with the law firms of Fetterly and Purdy and Purdy and Ashly, PA. He has been a principle investigator in numerous major fire losses including the MGM Grand and Las Vegas Hilton Hotel fires and the Cathedral Hill Hotel fire in San Francisco. Mr. Wiestling also served on the editorial board of “Fire Ground Commander”, and NFPA publication, and RJ Brady Company’s “Fire Ground Investigation”. Continuing Education: Attendance at yearly seminars sponsored by organizations such as the National Fire Protection Association, The International Association of Arson Investigators, and the Minnesota State Chapter of the International Association of Arson Investigators.